Fame can be fickle and destiny, perverse -- but what are we to call how posterity has treated Stefan Zweig? In the period between the world wars, he was among the best-known authors in the world and, by some reckonings, the most translated. Jewish by birth and Austrian by nationality, Zweig was perhaps most of all Viennese by sensibility. His fiction expressed the refined cynicism about sexual mores that readers associated with Sigmund Freud and Arthur Schnitzler, and he played the role of Vienna coffeehouse man of letters to perfection. His books fueled the Nazi bonfires. 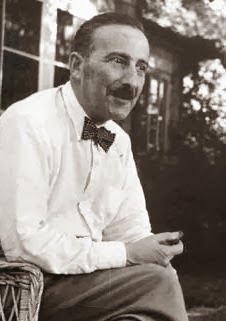 Even apart from their racial obsessions, Zweig was precisely the sort of author to drive Hitler and Goebbels into paroxysms, and after years of exile he committed suicide in Brazil in 1942. His reputation did not survive the war, either, at least not among English-language readers. After four decades or so of relatively far-flung reading, I think of him as one of those authors who seem only ever to show up in parentheses and footnotes, or sometimes pointed out as a biographer too prone to psychologizing or melodrama. Being barely remembered trumps being totally forgotten (it's more than most of us will be, anyway), but Zweig hardly seemed like a figure poised for rediscovery when, not too long ago, the comeback began. The essays and speeches collected in Messages From a Lost World: Europe on the Brink (Pushkin Press) form a supplement to the volume that launched the revival -- Zweig's memoir, The World of Yesterday, which the University of Nebraska Press published in the new translation that Pushkin Press issued in 2009. (Finished just before the author's suicide, the book first appeared in English in 1943. That earlier translation can also be had, in ebook format.) The recent NYRB Classics editions of his fiction have had a lot to do with it being more than a one-book revival, but e-publishing and print-on-demand operations account for nearly everything by Zweig in English now being available. A mixed blessing, given that some such "publishers" do little but sell you copies of material available for free from the Internet Archive or Project Gutenberg. "Never since it came into being has the whole world been so communally seized by nervous energy. Until now a war was only an isolated flare-up in the immense organism that is humanity, a suppurating limb which could be cauterized and thus healed, whilst all the remaining limbs were free to perform their normal functions without the least hindrance .. But due to its steady conquest of the globe, humanity forged ever-closer links, so today a fever quivers within its whole organism; horrors easily traverse the entire cosmos. There is not a workshop, not an isolated farm, not a hamlet deep in a forest from which they have not torn a man so that he might launch himself into the fray, and each of these beings is intimately connected to others by myriad threads of feeling; even the most insignificant among them has breathed so much of the feverish heat, his sudden disappearance makes those that remain that much colder, more alone and empty." "If men lived [in earlier eras] as if in the folds of a mountain, their sight limited by the peaks on either side, we today see as if from a summit all worldly happenings in the same moment, in their exact dimensions and proportions. And because we have this commanding view across the surface of the earth, we must now usher in new standards. It's no longer a case of which country must be placed ahead of another at their expense, but how to accomplish universal movement, progress, civilization. The history of tomorrow must be a history of all humanity and the conflicts between individual countries must be seen as redundant alongside the common good of the community." If the world could be changed by elegantly expressed humanist sentiments, this passage, from a speech delivered in 1932, might have altered the course of history. But the way it tempted fate now looks even more bitterly ironic than it did after Hitler took office a few months later. For in spite of his lofty vantage point ("we today see as if from a summit all worldly happenings in the same moment, in their exact dimensions and proportions") and a depth of historical vision giving him insight into Magellan, Casanova, Napoleon, Goethe, Nietzsche and Mary Antoinette (among others), Zweig was struck dumb by the course of events after 1933. Not literally, of course; on the contrary, later selections in Messages From a Lost World show that he could turn on the spigots of eloquence all too easily. (The tendency of Zweig's prose to turn purple and kitschy has been mocked at length by the translator Michael Hoffmann.) But he remained notoriously -- and to a great many people, unforgivably -- averse to speaking out against what was happening in Germany. He did say that, considering the company it put him in, having his book torched by the Nazis was an honor. Yet as a statement of solidarity against a regime that would, in time, burn people, that seems decidedly wanting. Uncharitable people have accused Zweig of cowardice, while Hannah Arendt's essay on him, found in Reflections on Literature and Culture (Stanford University Press, 2007) treats Zweig as an example of the cultural mandarin so determined to avoid the grubby realities of politics that he disgraced his own idealism. Whether or not that implies a lack of courage is a difficult question. But surely it isn't being excessively generous to wonder if Zweig's failure was one of imagination, rather than of nerve: the inability, first of all, to grasp that Hitler was more than just another nationalist demagogue, followed by a paralysis at seeing the mad dream of the Thousand-Year Reich tearing into reality across most of Europe, with no plan to stop there. Against the horrible future, all he had left was nostalgia -- with a memory of what security and boundless optimism had been like, once.